As a beer lover, I know there is always something on tap for me at Thirsty Lion. 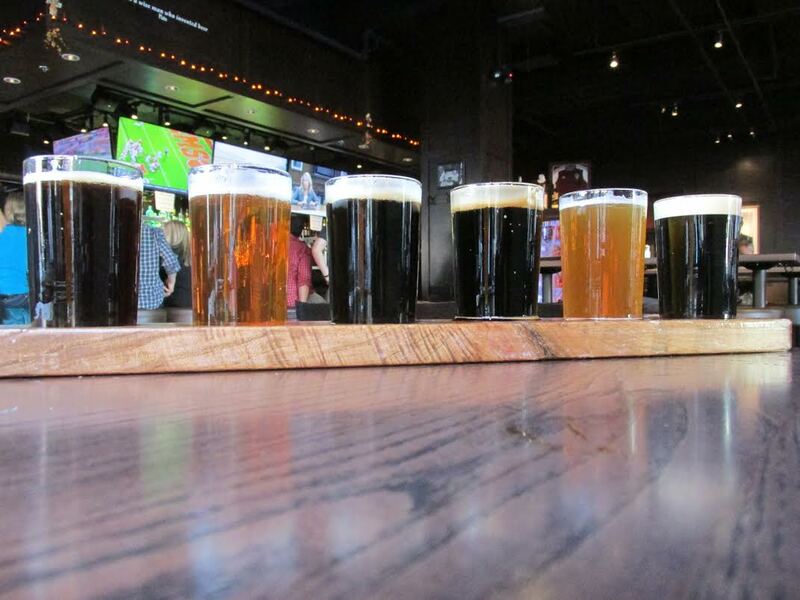 Its 52 taps has something for every beer drinker: ambers, IPAs, lagers, saisons, stouts and more. And while I typically stick with the same few beers when I stop in, I am always excited to see what’s new when the seasonal fresh sheet makes its appearance. The Fall Fresh Sheet came out, I knew it was time for another visit. Pan Seared Shishito Peppers with Chipotle Aioli. Paried with a Yeti Imperial Stout from Great Divide. I wanted to try the new Shishito Peppers, but I can’t seem to visit Thirsty Lion without getting the pretzel with beer cheese fondue (which is on the regular menu). So I decided to start with both! I’m never sure how hot shishito peppers might be, so I usually pair them with a stout, as a dark beer helps tame the heat. And the hint of smokiness complements the peppers’ blistered skin. Great Divide’s Yeti Imperial Stout was just the beer for this dish. Note: these peppers were very approachable; they were not too spicy, which allowed me to really enjoy the flavor. The decision about which beer to have with the pretzel was an easy one. What goes better with a soft pretzel than a traditional German lager? So I selected Prost Brewing’s Märzen, one of the fall seasonals. For the main course I ordered a Margherita Pizza (off Thirsty Lion’s regular menu) and a Breckenridge Autumn Ale (seasonal). The slightly sweet flavor of the ale went well with the pizza, and the mouthfeel of this full-bodied beer accentuated the chewiness of the crust and cheese. After my meal I was ready for something sweet. I was in the mood for chocolate, but I absolutely had to try the new Caramel Apple Cheesecake. So I developed a plan: pair the cheesecake with a Shake Chocolate Porter! And it was perfect! The creaminess of the beer and the cake were a winning combination. Seared Atlantic Sea Scallops, Pomegranate, Spinach & Pancetta Salad, Fennel Sausage & Sundried Tomato Pizza, and Black Berry BBQ Pork Tenderloin. Seasonal beers on tap are Woodchuck Fall Apple Cider, Breckenridge Autumn Ale, Elysian Night Owl Pumpkin Ale, Prost Märzen, Lefthand Oktoberfest and Leinenkugel Harvest Patch Shandy. And new cocktail items include a Pear Martini and Bulleit Rye Old Fashioned. Don’t miss these fall drinks and dishes; they are available now through early December. Next Post Deschutes Pop-Up Pub Comes to Denver this Sat., 10/17!